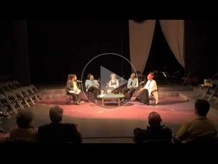 “Songs of the Middle Passage” performance and interview by The Marian Anderson String Quartet on April 24, 2013 at the George Houston Bass Performance Arts Space at Churchill House, Brown University. This entry was posted in Events, News, Performances, Recordings and tagged 2013, marian anderson string quartet, performances, videos. Bookmark the permalink. I heard a bit of your “Songs of Middle Passage” on democracynow.org today and found your music and your mission deeply inspiring on a personal level and as an African-American musician. Where might one purchase recordings of your music? Thank you for your inspiration and wishing you all the best.